How do you express your love in Washington? With a sly Valentine’s Day card that doubles as a biting partisan attack. 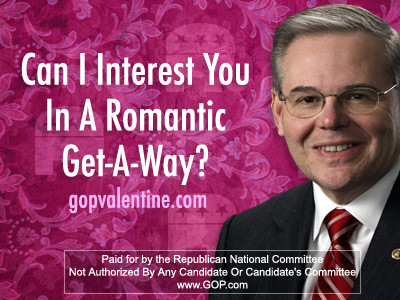 The Republican National Committee is featuring Valentine’s Day e-cards on its Web site, including one that makes a not-so-subtle reference to the most salacious allegations involving New Jersey Sen. Robert Menendez. This would be hilarious if it wasn’t so gross.